Indian paddlers were overawed by the enormity of the Olympics, says national coach Bhawani Mukherji, who feels that both Ankita Das and Soumyajit Ghosh should have concentrated on their matches rather than wasting crucial time participating in the opening ceremony. 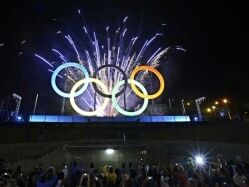 "Olympics is a big stage. All top level Indian athletes are there, some of whom you don't have even met before," Mukherji said. "Ankita was not looking focussed. She was marching happily alongside flag bearer Sushil Kumar while she had her first match next day. Ideally, she should have skipped the opening ceremony and concentrated on her match. They were certainly overawed by the occasion," he said. However, the national coach said Soumyajit was the better of the two participants and he just lost to a better opponent in the second round. "Ankita had a chance, she should have come up with a better result. She should have at least made it to the main draw. Soumyajit lost to a stronger opponent in the second round. He played well to beat Brazil's Gustavo Tsuboi in the first round, but it was just that the next opponent he met was better than him," Mukherji pointed. Ankita lost to Spain's Sara Ramirez in her opening match without putting much of a fight, while Soumyajit lost in the second round to South Korea's Kim Hyok Bong after beating higher ranked Gustavo in the first round. Former national champion Manjit Singh Dua, meanwhile, praised Soumyajit for his efforts and said he was one of the best things to have happened to the Indian table tennis in the recent past. "Soumyajit is the best upcoming player in the country. He has shown extremely good results in Junior World Championship where India won bronze. Otherwise, also he has won a lot of international events," Dua said.